Bus Lane Barcelona – 2, originally uploaded by andynash. 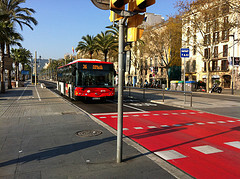 Very nice job integrating bus lanes into the waterfront street in Barcelona. High quality materials and design. Here’s a film from current TV on Cali Columbia’s new bus rapid transit system which is called MIO. It’s a nice film illustrating many of the benefits of BRT. At one point a user complains that she likes the older minibuses better – because the new system is too crowded! Not sure if that’s really a negative … a few more buses might solve the problem. For a slightly less serious look at South American BRT systems check out my music video parody: The Bus From Curitiba on YouTube. 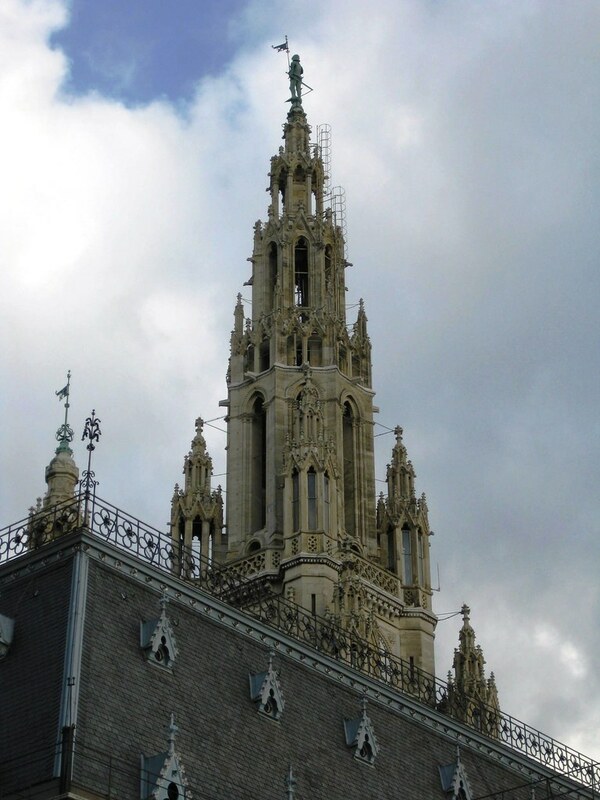 Bus Meister will help citizens lobby city hall (this is Vienna) in support of public transport priority (from my flickr photos). I just returned from a meeting in Udine (Italy) where I spoke about my Bus Meister idea of creating an integrated suite of web applications (game, social network and wiki best practices library) to help educate citizens on how to improve public transport operations (by introducing public transport priority measures) and to empower them to help actually implement these ideas. It’s a general approach that I think could be used to solve many urban problems. Going through my e-mail I was glad to read about Barcelona’s new BRT lines which one of my UC Berkeley professors, Carlos Daganzo, is helping plan. The article in the ITS Berkeley News is a very good summary of for the importance of public transport priority and BRT. Daganzo is a brilliant scientist, it’s great to see him working on improving public transport! My latest music video: “The Bus from Curitiba” probably needs some explanation, so here’s a little bit about bus rapid transit and then the words with a couple comments. Curitiba Brazil is famous for pioneering the development of Bus Rapid Transit (BRT). In the 1970s the city decided to build a very efficient bus-based public transport network instead of a relatively short section of metro line (which would have cost the same amount of money). The results have been nothing short of fantastic. Curitiba’s BRT system has been replicated throughout the world, although not to the extent that it deserves. Many cities are seduced by the thought of rail-based public transport preferring the sexiness of rail over the benefits of creating a more comprehensive public transport network. For more information on Curitiba see: the great Streetfilms Curitiba video showing the system in operation and describing how it works; Professor Robert Cervero’s excellent book The Transit Metropolis (which also describes many other interesting examples of public transport throughout the world); and the wikipedia article Rede Integrada de Transporte. BRT can be defined as the systematic application of public transport priority techniques. Zurich is a great example of another approach towards systematically applying public transport priority techniques; rather than building any large project Zurich incrementally added improvements that speed-up bus and tram service over the last thirty years thus creating a fast and efficient surface public transport system. You can read more about Zurich in Professor Cervero’s book and in some of my publications and on my website improving public transport efficiency. No we just don’t BRT. OK, I am not being totally fair. Planning isn’t always done badly, but as I outline above, I think too often we ignore the bus option (of course capital and operating funding programs also enter into the picture, but that’s for another song). And, of course, trams make sense in larger cities with strong demand, but gladly and badly is a pretty good rhyme don’t you think? Daniel Sparing, a colleague from Hungary, just posted the photo above on his flickr site. It’s a good picture of a public transport priority measure. He calls it a bus trap but says in the comment “or to be more precise, a car trap. Buses can pass through.” He’s got lots of great bicycling photos on his site too.